New this week are five exquisitely bound, pristine books from some of the world’s most beloved authors. Each a magnificent gift for yourself or a loved one. Enhance your collection with a personally hand signed book by Kurt Vonnegut, Stephen King, Clive Barker, Winston Groom, Tobe Hooper, Mick Harris, Sir Roger Moore, or former President Jimmy Carter. As always, thanks for stopping by, and if you haven’t already, sign up for our Free Newsletter and take advantage of time-saving alerts periodically sent right to your inbox, on all new arrivals, plus contests, featured book signing events, book collecting articles, special offers and more. Personally hand signed by Kurt Vonnegut directly into the book. See more photos here. In Vonnegut’s tale of the near future, a cold and malevolent universe is all that humanity can ever know. The richest and most depraved man on Earth takes a wild space journey to distant worlds, learning about the purpose of human life along the way. 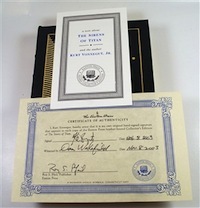 Norwalk, CT: The Easton Press 2003, Kurt Vonnegut, “The Sirens of Titan” Hardcover SIGNED COLLECTOR’S EDITION. Leather-bound book accented in 22kt gold. An outrageous romp through space, time, and morality by one of the greatest writers of our time.Signed by author on page preceding title page. Leather binding with no dust-jacket as issued. 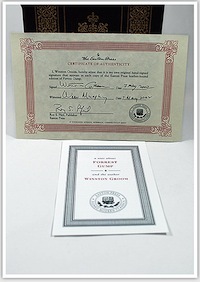 Includes COA (certificate of authenticity). Condition: Very Fine. All photos of the actual item. Personally hand signed by Sir Roger Moore directly into the book. See all photos here. October 2012 marks the 50th anniversary of the “James Bond” film series and this book is sure to become a rare collector’s item. 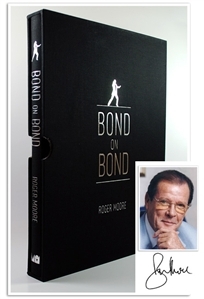 This edition has been personally hand signed by Roger Moore directly into the book. Michael O’Mara Ltd Publishers. A special edition for Waterstones. 224 pages. Roger Moore “Bond On Bond: Reflections on 50 years of James Bond Movies”. An exclusive Signed Limited Slipcased Edition. One of only 1,000 numbered and personally hand signed copies. A relatively heavy over-sized volume, measuring 12″ x 9″ and weighing 3 lb, 6oz. The definitive anthology on the “James Bond” film series, by Sir Roger Moore, KBE, who played the title role from 1973 to 1985, this book features rare photographs from the film sets, shared from Moore’s personal collection. Chock full of never before told stories of his experiences playing Bond, Moore illuminates and captivates the reader with his unique brand of humor and appeal. Gorgeously hard bound in black cloth with silver embossing, the book comes with a matching black cloth slipcase adorned with a matching silver embossed title. Personally hand signed by Winston Groom on a special limitation page. Buy it now. Enhance your library with this magnificent leather bound heirloom. One of only 1250 signed limited editions available. A luxurious collectible for your library. Includes COA to guarantee signature authenticity. Presenting a unique signed collectible from Easton Press. A luxurious leather bound heirloom, accented with 22kt gold, manufactured to last generations. A high quality book worthy of your fine library that also makes the perfect gift. This is a First Signed Deluxe Numbered edition limited to 450 . 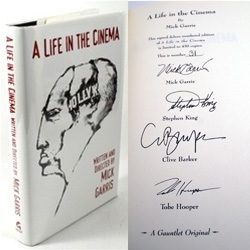 This copy is personally hand SIGNED by Stephen King, Clive Barker, Mick Garris, and Tobe Hooper on the Limitation page. This is very low number 31 of only 450 produced. Buy it now. Welcome to a dark side of Hollywood you’ve never seen before . . . This collection by Garris, a short-story writer and movie director perhaps best known for his cinematic adaptations of Stephen King’s stories, includes eight stories and one screenplay, all of which, to one degree or another, flirt with the horror genre. Condition: As new. Unread condition with original dust jacket in protective Mylar sleeve. 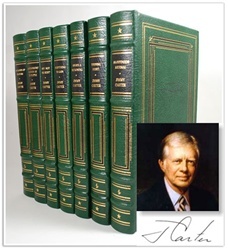 A Rare Signed Limited Edition Matching Volume Set for the Presidential Historian. Buy it now. 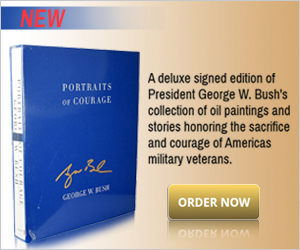 A wonderful signed limited heirloom collection to showcase in your presidential library. Each volume is luxuriously bound in full genuine leather. An ideal retirement gift for yourself or a for loved one. Very fine without any flaws. “Always a Reckoning” has been Personally hand signed by President Jimmy Carter on a special limitation page. This is number 1,020 of 3,000. Condition: All seven volumes are in As New condition. Very Fine. Mint and flawless.